"The applicant has clearly mined outside the [once permitted] 3 acre area ... without ... County approval, and the applicant has not provided reclamation of any kind." --From, Santa Fe County Land Use Administrator to CGP, July 6, 1999. Photo, 30 April 1997, looking south. White line is approximate area of the expanded gravel pit as of Jan. 2000. 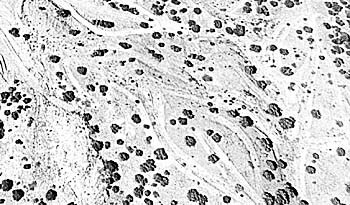 Unsuitable Siting: Narrow roads from previous exploratory drilling activities by Occidental Minerals in the 1970s (gray areas) that some county officials deemed significant, do not justify or excuse the poor siting problems encountered here for strip & crush gravel mining (white central area). Its neighbors include the village of Los Cerrillos, the Rancho Alegre subdivision, numerous individual residences, and the Turquoise Trail National Scenic Byway, and it is directly adjacent to the 1100-acre Cerrillos Hills Historic Park. 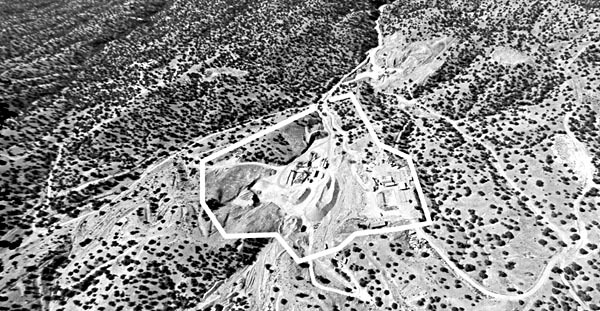 It is, however, significant to remember that the (then named) NM Environmental Improvement Agency denied "Oxy" permission to mine and that the people of the area were, as with CGP, likewise overwhelmingly opposed to that operation. 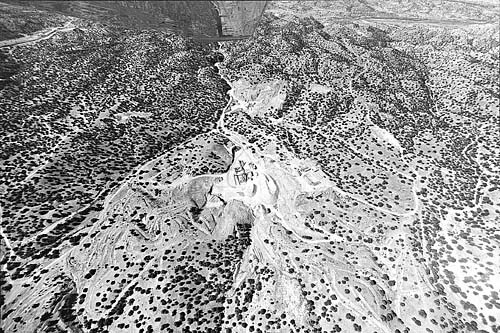 Documents: The Cerrillos Hills, 1974 to 1978, A Battle For the Land & Water, Simmons / Lockridge, 1990. In 1993 "Cerrillos Sand and Gravel" (who then more fit a description of a "small" gravel yard) became Cerrillos Gravel Products in association with Richard Cook of Associated Asphalt, a very big time operator. Associated moved in a crusher and the original 3 acre zoned gravel "sifting" operation became over night a heavy hard rock industrial operation that in a few short years stripped considerable acreage beyond the permitted zone. The Santa Fe Board of County Commissioners has shut down ("suspended") CGP for its egregious excesses, requiring, among other things, the reclamation of the over-mined area. The local people are overwhelmingly opposed to ever reopening this poorly sited incompatible industrial mine. --Santa Fe County suspended the gravel pit's permit 26 Jan. 2000. The Memorandum of Understanding (MOU) & Reclamation conditions. --The gravel mine near to historic & prehistoric mine sites (195 k). --CGP owner: Brad Aitken of Houston, TX; operator: has been Richard Cook, of Associated Asphalt, Espanola, NM. Oxymin 1978 (approx. ), the eariliest photo thus far.